Translation: Abandon all hope, you who enter. So reads the inscription on the walls of the City of Dis in Dante’s Inferno. This quote has captivated me from the first time I heard it as a teenager but I could never say exactly why. It was something I needed to remember. There was a deeper meaning there for me, I just didn’t know it then. Seems like a less than cheerful thought after such a lovely Sunday doesn’t it? Perhaps there’s a better way for me to put it. Translation: I discovered every hope, because I dared to enter. So reads the cover of my journal. Enter what? I know a little of Hell – at least enough to understand that lost hope of which Dante speaks. I understand what it is to lose my way, face my own darkness and what it is to find my way back into the light. But it isn’t the hell of Dante’s depiction that I enter into so much these days as it is the mystery of my life and all its new challenges. I never know from one day to the next how well I will feel. Will my hands hurt today? Will my feet hurt so much that my already pronounced limp will be even worse? Will I be able to open the bottle of apple juice for my younger son or will I need to ask his big brother to help? Will I be able to see the computer at work or will the shadows come creeping in yet again? So many bigger questions come on the heels of these. How long will I be able to work? Will my kids eventually end up taking care of me? But then there is the biggest question – does it matter? Very simply, no. What matters is that I know that God has given me everything I’ve ever needed. I’ve never lacked for love, affection, friendship, support or guidance. I have found joy and hope in the most unexpected little things – the first crocuses of the season, a patch of grass reappearing as the snow melts and the wonder in my children’s eyes as they gaze up into the stars. I have found peace in simple things – the lap of the waves on the shore, the words of a poet, and the flight of a raptor. What is it about the raptors that draws me in? The red-tailed hawk, the osprey, the wayward white-tailed kite – they are my brothers. Their power, strength, beauty and grace capture my soul. From the moment I see one of these fabulous birds, I have to stop to watch their flight. I am swept up and for just a moment, I can see what they see. I can see everything along my path and it’s a beautiful path ahead. And then I’m back on the ground, aching and tired again. But I’ve caught a glimpse of the lay of the land and this walled city that I’m in right now is just a passageway. There are a great many things that lay ahead. Some will be frightening. Some will be amazing. All come from God and therefore, all are good. Even as my eyes see shadows tonight, I see more clearly every day that when I ask for God’s help, I will not be left wanting. I drove down to Stratford Seawall last Saturday, as I do most every morning. The sky was stunning shade of blue. The snow blazed a dazzling white against the sand. The water was a calm dark blue at low tide and the gulls were calling to each other up and down Russian Beach. These are the colors and sounds of my invitation. I come here every day as I have for the past 25 years. Sometimes I can only stay for only a few moments, other days I spend a few hours. Always I feel the pull, the call, the invitation to just BE in this place. When I first moved to Connecticut, my parents used to bring me to the wall after church, especially in the spring and summer. When friends and family visited from out-of-state, we always went to the seawall and walked the beach. After my dad passed away, only twenty months after moving here, I started to ride my bike to the seawall almost every day. I often did so without permission but even at 14, I found and felt something different in this place. Something I wasn’t finding in church or at home or anywhere else for that matter. I didn’t understand it, but I couldn’t stay away from it either. I’ve explored the bluffs and the rocky Stratford Point. 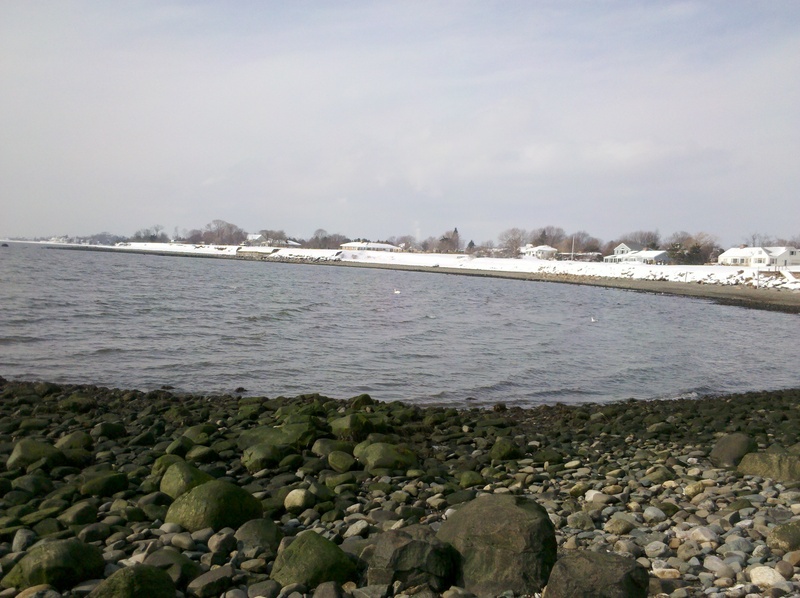 I’ve walked all the way around the point and up the Housatonic River to Short Beach. Some days I’ve walked in joy, in grief, other days in anger. Some days I’m feeling lost. Other days I’m hoping to get lost. Somewhere along the line “the beach” became “my beach” and the east side of Stratford Point became “my chapel”. I’ve watched many seasons come and go. I’ve walked my beach immediately before or immediately after storms, when the air is pregnant with the smell of rain. I’ve walked through snow squalls and biting cold. I’ve seen and photographed rainbows, sunsets, moonrises, the first star of evening, stunning cloud formations and even an odd translucent white figure. A fellow wandering beach soul perhaps. My beach became a tangible metaphor for my life, ever-changing and always in motion. No two days are ever the same. The broken sea glass, worn by wind and waves fills vases around my office. Seeing something shattered, broken and jagged that has been transformed into something smooth and beautiful has brought me comfort. Seeing the birds soaring on the updrafts has brought me a sense of freedom. No matter what the weather or what storms come, my beach is always wild and untamed. It has become my custom to listen to music as I walk, keeping the volume low enough to hear the shifting sand beneath my boots and the waves lapping at shore. My soundtrack allows me not to think beyond the words of the familiar hymns and with the mp3 player on shuffle, there is no expectation of what I’ll hear next. Saturday was different. All my walks are different really, but this one was keenly poignant. I haven’t been strong enough to walk all the way out to the spot I call my chapel since March 2010. I had my work cut out for me just to get to the beach. The snow is piled up higher than the seawall and the sidewalk and steps to the beach are not cleared at all. As I walked, an osprey, whom I rarely see outside the marsh, was flying long low passes all along the water’s edge. He fascinates me. How could one creature contain so much strength, beauty and grace? I was being given something to ponder as I walked. It took me longer than it used to but I reached my chapel. The view was exceptionally breathtaking. The sun beat a path across the water until it kissed the four boulders that make up a natural altar when I had laid a pyramid-shaped stone and pieces of seaglass that I’d picked up along the way, a simple offering of joy and thanksgiving for such a beautiful day. I stayed at the point only an hour, a time spent in silence, the music turned off and the mind too, if only for a little while. I sat perfectly still and just breathed in the light that was all around me. I saw the tide turn and after taking a few photos, I began my long walk back. I don’t know when I’ll be able to make that walk again. I know that there will come a time when I will not be able to make that walk at all. Hopefully that time is long, long way off. But when that day does come, I have my private reflections of all that I’ve experienced over the years and I have my photos of my beach and my chapel. The light that I breathed in a week ago has not left me, although it is not something I can hold on to any more than the rocks can hold on to the water. The water changes the rocks over time and I suspect the light is changing me over time as well.